The other night, I had a dream I was wading through dozens of enormous turtles. 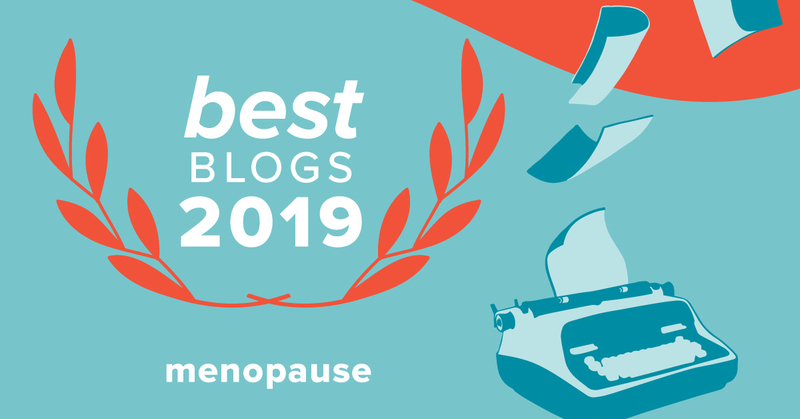 And so the next day I tried to figure out the dream’s message for this menopausal blogger. Should I up my efforts to declutter the house so we can fit into a smaller shell in a few years? Do I need to increase my walking pace? Wear stronger sunscreen to prevent leathery skin? Buy some funky placemats in an earth-toned geometric print? Eat more greens? Be more patient? Be less patient? Should I tuck in my head, think deeper, and write harder? Or does dreaming of turtles suggest I am behaving much too turtle-like? Do I need to stop writing with such intensity and abandon my semi-turtle shell life? More party and less keyboard pounding? Was the dream’s purpose to teach me, once and for all, that I need to get over the frustration of not being able to solve the world’s mysteries? I’ve always wondered how it feels to be a turtle, and I will NEVER have the privilege of knowing. Chill, Barbara. But I still wonder: Do lady turtles go through menopause? Bless their turtle hearts if they do. Menopause and a shell can’t be a great combination. OR (and I promise this is the final “or”) does my dream mean, plain, happy, and simple, that I’m lucky, very lucky, to live in a world graced by amazing and intriguing creatures? And now a hypothetical question for you, my dear human readers: What would you MOST like to ask one of the world’s creatures? Leave a comment by clicking on “Comments ” below. 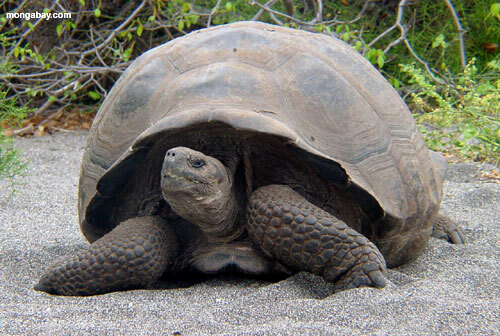 Photo: I found this lovely turtle, who is really a tortoise, on Mongabay.com. I’m pretending she has in-shell access to the Internet and is a fan of Friend for the Ride. I’d love to have some readers in the Galapagos! Change Your Life! Learn once and for all, the difference between a turtle and a tortoise by watching this SHORT video. This post is presented in honor of students everywhere who are truly working hard to finish up their semester. I was at the beach a few weeks ago, having a perfectly lovely time, and in the dark of that beachy night, it appeared: THE OLD COLLEGE DREAM. There’s a class I registered for, but I haven’t been attending. It’s too late to drop the class. But it’s also too late to go back to class and catch up on the work I’ve missed. I’m most likely going to get an F.
I have an alternate college dream. I think I have a term paper due at the end of the semester in a specific class, but I’m not really sure. And for some reason, I don’t ask the professor. I just don’t do the paper. Here comes another F.
I had a great time in college. I didn’t miss many classes. I turned in all my term papers. And I didn’t get any F’s. So why is this menopausal girl, many years past college, still having VERY scary college dreams? Why can’t I dream about the parties? Or sunning on the quad? Or spring break? The next boyfriend? Something fun! I don’t have a clue. But both women and men friends report similar dreams. I’d love to draw some brilliant conclusion. Maybe the dreams mean we’re not as old as we think we are. Maybe the dreams represent all of our fears of failure. Maybe their purpose is simply to remind us of a stressful but usually very happy time years ago. And just maybe, college dreams make us glad for the present, with its own set of problems, but no term papers, intimidating professors, or terror of fat F’s on our transcripts. Let’s give out the old college cheer for the here and now. 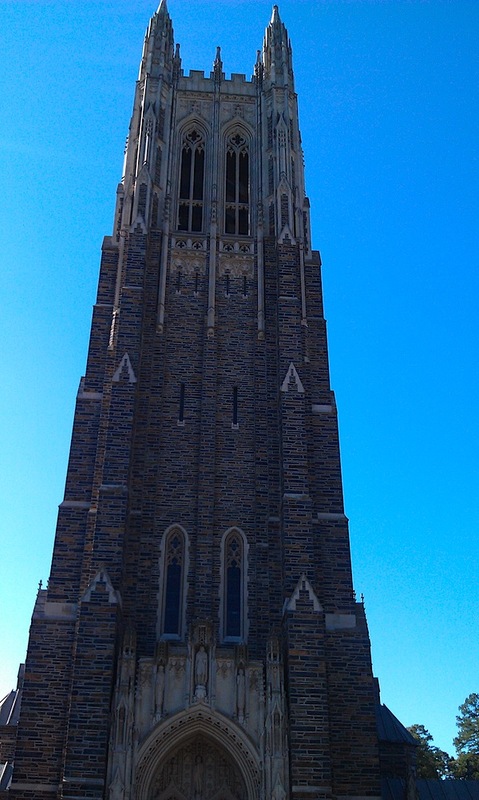 Photo Above: The chapel at Duke University, my alma mater. The photo was taken by my daughter Laura for her blog, Taking Back My Twenties. 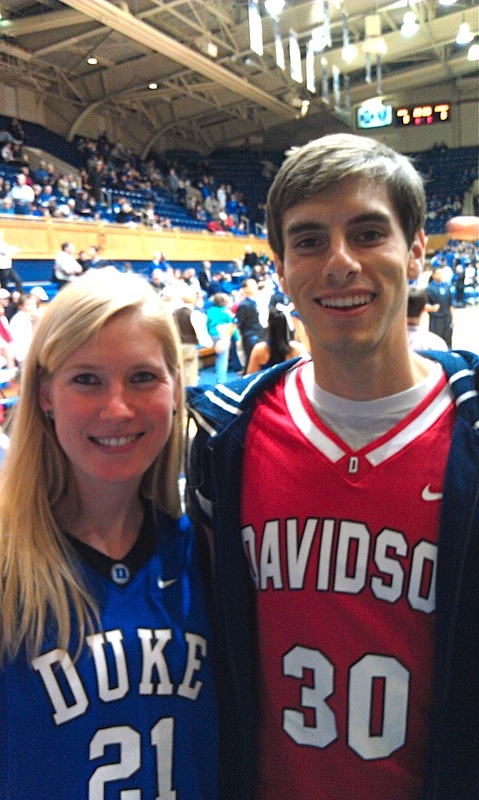 Photo Below: Laura and her boyfriend Matt Allen at Cameron Indoor Stadium after Duke beat their undergraduate alma mater, Davidson College. If Matt is dreaming of papers and classes, that makes excellent sense as he is now a student at the Fuqua School of Business at Duke.